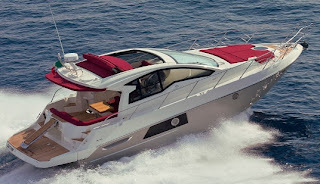 Cranchi presents the M35 ST, a medium sized hard top sport cruiser based on the hull lines of the 36 Zaffiro. The M35 ST has been a much waited model from Cranchi, and in fact a hard top 36 Zaffiro was announced a few months after the standard open radar arch model was launched in 2008. Considering how the demand for this size with hard top has increased Cranchi is late in this regard. The Cranchi design team while in the works of this new model, also presented a new cockpit design to this model which improves the layout from the 36 Zaffiro. The entrance to the aft deck on the M35 ST is now moved to port side, and the C-shaped settee is to the opposite and larger. Inside the layout is a copy of the 36 sleeping four plus two in two cabins plus a convertible saloon, with a galley and shower head in the middle. New large view windows have also been added to the hull side serving the guest cabin to midships. Power is from twin Volvo 300hp which give a max speed of 34 knots.